Rockman Corner: With Universe Gone, What's Next For Mega Man? With Universe Gone, What's Next For Mega Man? After word of Universe's cancellation hit, a feeling of uncertainty for Mega Man's future quickly set the internet ablaze. It doesn't matter if you liked Universe or not -- what matters is, something doesn't feel kosher with franchise, and it's raising eyebrows. Ever since Inafune's leave of absence, the IP has been subjected to a downward spiral of not-so great news. From Legend 3's wavering development to Capcom Japan's negative impression of the series popularity overseas, Mega Man's future, for the first time, may truly be unpredictable. Sharing in these sentiments is GameAbyss writer Andreas Asimakis. Andreas, like your average up-to-date fan, awoke to March 31st with news of Universe's cancellation. From there, he couldn't help but suspect something troubling was going on with the IP in general. "For all his iterations, the original Mega Man always remained my favorite. And to see this 8-bit superstar get so much attention made me happier than words can express. But in the wake of Universe's cancellation, I honestly wonder what happens to the classic Mega Man series now. There was a time where this year's E3 would surely bring the announcement of Mega Man 11; now I'm not so sure. And what of the other retr0-inspired Mega Man title, Rockman Online? It has been far too long since we've had any updates on this ambitious game. Am I to assume that this potentially groundbreaking Mega Man MMO will be cancelled as well?" All speculation, of course, but speculation founded on legitimate grounds. This air of uncertainty is scary, and the silence on Capcom's end, a lack of some form of reassurance, isn't helping either. Mega Man is just as much as Capcom as Resident Evil and Street Fighter. When you think of Capcom, you think of the Blue Bomber. It's a very important, iconic property to the company, and I highly doubt his days are numbered. It is my firm belief that Universe's cancellation will open doors to new possibilities and opportunities. Universe was obviously suffering from a rough development, and no longer a thorn in Capcom's side, perhaps now they can pool their efforts and man-power into other MM projects. Legends 3? Maybe now development will truly kick off. The highly demanded X9? For all we know, MMU staff have been diverted to work on that at this very moment. Mega Man 11? Hey, it could happen. Uncertainty doesn't necessarily spell doom and gloom. Quiet on Capcom's side, for all we know, could mean something is in on the burner. "No news is good news", as they say. We have three channels to make our voices heard -- three direct links to Capcom: The Legends 3 Devroom, Ask Capcom forums, and the Suggestion Box. Capcom doesn't spare a passing glance. They are actively looking and listening to our feedback, even if it doesn't appear that way. Show support for the franchise, and take advantage of these channels. If you're concerned about the franchise's future or want to aid in its development (join the Devroom! ), raise your voice. We got Mega Man 9 to happen; Legends 3, almost, too. Someone's listening. Megaman is way too much of a cash cow for Capcom to let it die. But to be honest, I'd rather see few good games than a ton of crappy games. I do understand the risk of the IP falling to the wayside, but like I said, given the sales of the most recent games, I would have hard time believing that's possible. I instantly thought of X as well. The cancellation of MMU so close to the rerelease of X on VC, as well as X and Sigma being pretty high in the MvC3 polls, have been strongly leaning towards a new wave of Megaman X fandom. The fact X and Sigma beat Classic must have scared Capcom since MMU was already disliked. t'd be a shame to loose yet another title. Damn, Capcom, what is your plan? As everyone's well aware already, I wasn't a fan of Mega Man Universe in the slightest, and its cancellation didn't effect me at all; at least not in a negative way. Some of the faith I've begun to lose in the Classic series has been restored as a result of it getting cancelled. As far as I can tell, the only thing in store for the Classic series in the future, is Mega Man 11. Although Universe was cancelled, I'm still counting on that to be the series' saving grace. I think Capcom went above and beyond with Mega Man 10, and I'm hoping they do the same with that one. This is all because Greg spilled coffee on Capcom's Prized MacBook Pro! I hope you're happy, Greg! Why was Mega Man Universe cancelled anyway? Capcom should give more details about it. It's too vague in the moment. Huge fan support and constant demands on improvements and continuations to the older and newer sagas is what kept the Rockman series alive for over 10 years. Let's keep it that way. Let us unite and increase our presence and the clarity of our voices. Let's show Capcom we're not gonna give up on Rock. Hard to say home much involvement Inafune has had with Megaman games for years. I don't think Megaman will be going down the drain anytime soon. Well, not for lack of games at any rate. That someone was Inafune. OOPS. Inafune isn't the end all be all when it comes to Mega Man. IF HE WAS, then we would of had MML3 years ago. It's sad to see old franchises die as the wave of first-person shooters keeps pouring in. The Mega Man series of games has always been a favorite of mine and I think there's a very large amount of potential for where it could go. Gee funny Inafune still had bosses to answer to who didn't want to make a Legends 3 10 years ago. THINK BEFORE YOU SAY STUFF LIKE THAT. Just like x6-8, even though Keiji didn't want them made nor Zero brough back, the heads at Capcom said otherwise. Same with every freaking megaman series after Keiji MOVED ON.It's the same reason why Legends 3 STILL HAS NOT BEEN GREENLIT. BECAUSE THE HEADS OF CAPCOM ARE A BUNCH OF IDIOTS. Yes but without out him to vouch any more Capcom is even LESS likely to want to use any of the franchises. It took him ALL those years to get Legends 3, what do you think will happen in the future without someone like him to demand it in Capcoms corporate structure? If Capcom continues to treat Megaman like crap, they are going to lose fans. If they lose fans, sales go down. If sales go down, the franchise itself will be deemed 'not worth it' and put up for sale. If it's sold, another company like Nintendo or Inti Creates or wherever Keiji is now can buy it, and if it's in Nintendo's hands(who published Megaman 6 in America because Capcom thought it wouldn't be worth it) or Keiji's own hands, then it'll be the good ol' days once again. 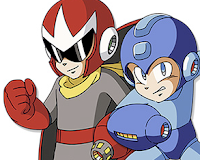 A Megaman Keiji has 100% control over or the House of Mario which makes sure each main release is quality and is the main company to have megaman games is what I personally think is the best for Megaman. Oh, this couldn't have been some elaborate ploy so Inafune could buy Megaman out in its entirety. I think the ceasing of production for UNIVERSE was done because the game didn't meet the expectations of the higher-ups and the project just wasn't moving in the direction the staff would have hoped for. It's possible that the game will receive a major overhaul and be released as a different title in the future, or perhaps the game will go the way of ZELDA III on the NES and be sliced-and-diced into other titles (as Z3 was into ALTTP and Link's Awakening). ROCKMAN ONLINE seems like it will most likely be released in the future, if for no other reason than that it's a third-party title in Asia, where MMOs are a dime a dozen. The game seems to be in beta right now, and may come out either this summer or sometime in the fall. At this point, I wouldn't be surprised if the cessation on Universe was done in favor of X9 or MM11. In fact, the release of Rockman X on the Virtual Console seems to hint at this possibility. Now that he's gone, Capcom's flushing the franchise. Either it's going into extinction or it'll become exclusively Battle Network-Pokemon wannabe fodder. The side-scrolling, buster firing days are over. I'm all but certain of it. Comcept will but the franchise. From the appearence of the trailers, MMU was pretty complete. The only thing we haven't seen are boss fights. If this project really is cancelled, you can count on it being leaked like starfox 2 or thrill Kill. I think they doubt mega's popularity over here because hell every time a new game gets announced you here more whiners about it not being "their" Megaman. We all need to come together and support each Megaman game that's released in America. Hell Legends is a game many have been wanting for years and yet I see Megaman fans complaining about it. Although the Legends series was different it was still awesome if you actually played it and finished it. While I didnt too much care for Universe's direction (control problems) I still would have bought the game and experienced it first hand before dissing it (hopefully I wouldnt have had to). I'd say we're just in an age of regression. We pretty much saw a Classic game like every year and a half about two decades ago? And then an X game at around the same rate in the 90's? Then came the Network Team with the Legends games, which flopped, with development on X games continuing. Around the turn of the century, IntiCreates comes out with the Zero series, while the Network Team starts on EXE. Then a third team is formed initially against IntiCreates' wishes and revives the X series. We saw about three games per year during this period. Who knows what became of that third team? They disappeared when the Network Team moved on to Star Force, and IntiCreates moved on to ZX and 8-bit Classic games. Star Force arguably flopped. ZX definitely flopped. However, because the rate of releases have slowed down and they aren't that predictable anymore, the franchise is suddenly on its last legs? I'd like people here to try telling that to Darkstalkers fans, Breath of Fire fans, and so on. (Admittedly, we probably won't see any Rockman game being released this year now with MMU canceled, which I would think is an unprecedented first. Seriously guys, the EXE era of releases wasn't normal. It never was normal. Normal would be about one game per year, which we are still mostly seeing. What we are seeing is Capcom realizing that they have made the development teams overextend themselves since the middle of the EXE era. Nothing against ZX, but it was a largely unnecessary series when X still has a ton of loose ends that needed to be wrapped up. Star Force was also largely unnecessary when Legends had more or less been in cliffhanger purgatory for about a decade. And at the risk of getting Classic fans like Professor Megaman up there wanting to hang me, MM10 was largely unnecessary for the same reasons as ZX as well. Hell, ZX itself is now going into the same kind of slumber that Legends had just gone through. It's a freaking never-ending cycle for IntiCreates. You know, I think it says quite a bit when someone like I who joined during the EXE era has to be the one to finally say this. Way to not read the post, Roy. Whatever happens, happen. Sure, I'd be kinda upset with capcom if they ditch megaman for RE characters or something, but then capcom would be going against everything it's done. Anyone here remember the "fad" game genres? It went from horror to platformer to action to adventures to all sorts of other things, and now its shooters. Guess what hasnt been making games based on those fads, but instead making games the way they're always done it? Thats right, Megaman. If they do drop Megaman, they'll most likely pick him back up after FPS's are out of date. To be fair, there's still word of a 3DS rerelease of MM2. With the earthquake and tsunami, I'd expect Capcom to be backpedalling on projects without particular hope. Plenty of other game companies in the region have done the same, and Universe was a game that made for easy laughs at GDC. Is this a sign that Mega Man's going downhill? Perhaps, in a roundabout way. Capcom might've worked through the issues regardless of the power issues if they thought it'd be worth the effort. But in all honesty, this strikes me more as a Mega Man Universe problem than a series-wide issue, this cancellation. Not to say there isn't an issue. Inafune went pretty far out of his way to kill of Battle Network and Star Force in one go with Operate Shooting Star-- part personal opinion, part observation of the fact it was an updated rerelease. Between the game's abysmal sales, and Capcom Japan's lack of knowledge regarding Mega Man's international popularity, I'd be surprised to see a BN or SF game released within the next 10 years, a la Legends. Someone in Capcom-- Capcom Japan, Capcom of America, whichever-- needs to take charge of the Mega Man brand. Someone with new ideas, someone with initiative, to keep a sense of passion in the series. This isn't Resident Evil. Mega Man has a lot of different series under the single umbrella-- at this crossroad, you can't simply say, "Oh, well, let's make a sequel!" Capcom needs to find this guy-- someone who can take a ball and roll with it-- to make a new Mega Man series. That, regardless of what other curve balls come, would keep the Mega Man brand alive for some time. Huh, wonder what happened to my previous post. @ the elephant: Dang. 100% agreed with what you're trying to say, although someone was saying that Universe was really officially canceled last month, according to what they heard about a Famitsu issue. And no BN or SF game within the next 10 years? Hm... All I'm expecting is that neither series may recieve an entry within the next two or three years. 10 is rather out there, as I don't think Capcom would want to give up on them that readily. Unless they come out with a new Network Timeline series instead, or at the very least, an EXE collection, which I'm expecting after Legends 3 is done. But yeah, they need people with vision to lead the Rockman franchise's two development teams. The problem with that is, are there even such people within Capcom right now, and more importantly, will the Capcom higher-ups even listen to such people? Last year, I would have said 'perhaps'. After sitting through the MvC3 hype train, Inafune's resignation (mainly reading through the interview where he announced his resignation and why he resigned), and Universe's cancellation (as on the fence about it that I was), I'm not quite so sure anymore. But who knows what's going to happen, right? Personally, I would really like a MMBN 7. It should be a 6 if Lan never moved. But better. Style Changes back, liberation missions, tourneys and Duo's return... It has to be perfect. Wii would be able to hold the memory, or the amount nessessary. And a MMSF 4. idk what will be there. Bring the Crossover port of MMBN 1 over stateside. Then do a sequel of MMBN 7, but focus on that Patch guy, proving that his great grandson is Geo... EPIC BN/SF... And X9 and Legends 4 to keep everyone happy. @Alilatias: Then Capcom has found a comfortable excuse for the game's cancellation with the earthquake. Interested in that Famitsu mention, as Google's got nothing on the matter... I'll give Duck Duck Go a try. Expanding on Battle Network's future, OSS sold a whopping 70,000 units, give or take. Legends 2 was able to make it to 100,000, and Legends 1 surpassed that-- which warranted cancelling the series. Battle Network rereleases might be a touchy topic at Capcom for some while. I'd buy an EXE series collection if they made it. I just don't expect it, here and now. Would an empowering individual be able to take lead of the Mega Man brand, given current Capcom missteps? Only if Capcom executives made an effort to do so. If someone in charge, in Capcom, went out of their way to pick out someone to head all that is Mega Man for a decent stretch of time-- enough time for multiple games-- I'd expect that executive to have enough trust and faith in their decision to give the guy both leeway and attention when asked for it. The earthquake is the wild card, though. Rolling, time based blackouts are crossing Japan on a daily basis, meaning Capcom Japan has limited, government-dictated work hours right now. The odds of a new game-- or series, fan that I am, latching on to that possibility-- would only be decent abroad. Inafune was looking to step up non-Japanese development studios.